Football has become way too commercial. From the shirts covered with sponsors, to the salaries surpassing 200,000 pounds a week, to the ordinary fans now priced out of games, I didn’t think it could get much worse. That is until I heard the countdown to kick off over the tannoys at the European Championship. It’s hard to see how the game can sink to a more crass level. And then there’s a day like today when something happens out of the blue to restore a little bit of my faith in football. Thanks to @Pernambucogypsy I heard about Vitoria, a second division team from Bahia state who came up with the most novel campaign to encourage fans to give blood. Vitoria has removed the traditional red hoops from its shirt and told supporters it will add the colour back gradually as fans donate blood. Vitoria president Alexi Portela Junior said the club plans to add a red hoop back after each game, starting with next weekend’s match against Parana. The club has four red and four black hoops on its jersey. “In this novel way we are making our fans aware of the importance of giving blood,” Portela Junior said. The campaign comes just a few weeks after Sao Paulo, one of Brazil’s biggest clubs put the slogan “Give Blood” on their shirts for a game. Vitoria, which based in Salvador, the capital of Bahia state, was founded in 1899 and is one of Brazil’s oldest clubs. It is famous for having launched players such as World Cup winners Bebeto and Vampeta, and current Chelsea defender David Luiz. It currently sits in fourth place in the Serie B after eight games and is one of the favourites to gain promotion. The give blood campaign already seems to have brought them luck on the pitch. In their first red-less shirt, they beat Avai 2-0. Here’s the club video promoting the campaign. The web site has all the details of where and how to give blood. It may be a smart marketing ploy. But that’s fine by me. It’s for a good cause. Everybody wins. My friend and colleague Larry Rohter was vilified in Brazil a few years back for writing two stories that offended Brazilians. But Rohter was right on the second issue, as a new OECD study to be released on Thursday shows. 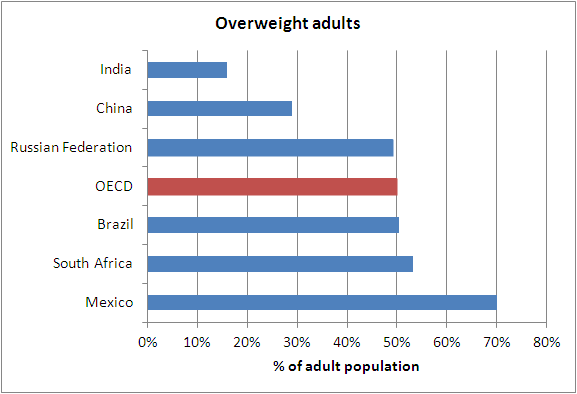 Figures show that 51 percent of adult Brazilians are overweight, above the OECD average. “Unhealthy diets and physical inactivity are pushing obesity rates rapidly toward those seen in OECD countries, where half of the population is already overweight and one in six people is considered obese,” the report states. “Seven in 10 Mexican adults are overweight or obese, while nearly half of all Brazilians, Russians and South Africans are also in this category. China and India report lower levels of obesity, but are also rapidly moving in the wrong direction,” the report adds. These results are not new. I wrote about this here for the Daily Telegraph back in 2008, as well as here for Time magazine in 2009. Back then, a leading doctor told me that a quarter of hospital beds in Brazil are taken up by people suffering from weight-related ailments such as heart attacks, back surgeries and hip and joint replacements. Although the numbers I quoted in these previous stories differ slightly from the OECD numbers the trend is clear. Brazilians, famous for the body beautiful, tiny bikinis, and lovers of plastic surgery, are getting fatter and thus falling into line with the rest of the world. 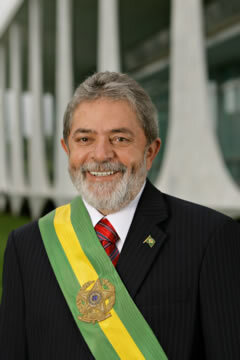 When Lula took power in 2003 he said his priority was making sure that every Brazilian would have the means to eat three square meals a day. He has to be admired for doing everything possible to keep that promise. But today, the biggest issue is not making sure that Brazilians have enough to eat. It is making sure that Brazilians don’t eat too much.